On this week’s episode, Harley and Brett fight the spring snow to explore Abbeville, Alabama, you know….the Yellowhammer State, the “Heart of Dixie” or the “CottonState”. We discuss a creepy haunting, phantom, cryptid or something called Huggin’ Molly. 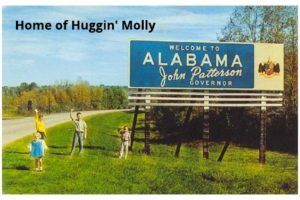 How scary can it be with a name like Huggin’ Molly? This oddity may or may not scare you, but don’t let that keep you from traveling here. The town is like a time-capsule. The Statue of Leroy Brown, the famous fish? Yes we are telling fish stories and ours is bigger than yours. No Episode of the Travel Oddities Podcast would be complete without a place to grab a bite. Huggin’ Molly’s restaurant obviously has been listening to our show. They have the lore and they built a store! If you run into the propriators…..tell them we accept cash or card. The Top 5 was instrumental in the completion of this episode. Specials thanks to Logan for the beautiful feedback and for sharing his story.